For a city like Richmond, brunch options are certainly not as prevalent as they are in Vancouver proper. For that reason, it makes sense that Eggspectation has chosen the Accent Inn as its first home in Western Canada. With roots in Montreal and a brunch menu available every day, I was interested in visiting this restaurant group's first location in the 604 and getting my brunch on. The lobster benny was two poached eggs accompanied by gently sautéed Maritime lobster on a toasted English muffin and a natural lobster reduction sauce served with Lyonnaise-style potatoes. I'm not sure about that lobster reduction sauce as read from the menu but there was indeed a heaping helping of hollandaise sauce on top of these eggs. For the actual lobster, this was a sautéed lobster, so don't go wild with your expectations of a lobster tail on each egg, especially for a market price of $25. The eggs are poached to style (I chose soft) and on poke from my fork, popped with a satisfying ooze. This, combined with the smooth hollandaise (no flavour enhancers like dill though, unfortunately) made for a pretty serviceable benedict. 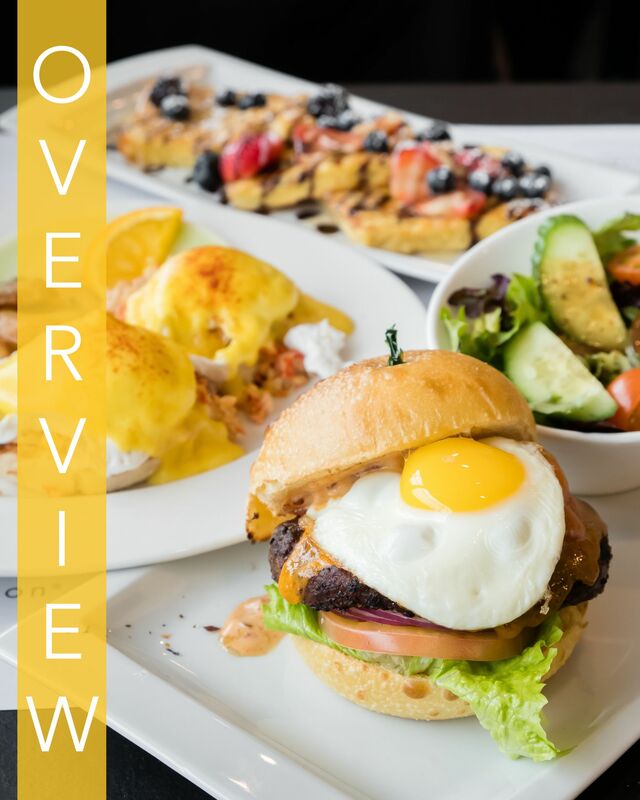 Given most bennies here are priced between $13-$17, the brunch costs a hair under the super popular Vancouver brunch spots. If I could make any change to this benny it would be to toast the English muffin a little more as mind was pretty floppy compared to my personal preferences. Next up from the lunch menu was the namesake Eggspectation Burger. This was a Butcher’s Block Reserve Angus beef burger dressed up with chipotle aioli, lettuce, tomato and red onions with strips of crispy smoked bacon over melted cheddar cheese and a sunny-side-up egg on top. Presentation was terrific with this burger showcasing a happy sunny-side egg on arrival. The gooey cheese and dripping chipotle aioli invited me in for a photo. Taste-wise, this was a very serviceable burger. Served with a choice of side (we opted for salad over fries) this is also priced competitively amongst the usual burger choices in Richmond (i.e. not many). Also, I appreciated the use of real lettuce which looked decent and much more preferable to the shredded variety. Biting into the patty, I could taste some of the juices grilled within and savoured the gooey cheese melted on top. Bun-wise, this was a sesame-free bun but it was at least still kind of fluffy. Standards were met with this burger (and if you search this blog, you know I love burgers). For dessert, we had the French vanilla sheet toast. As a kid, I was never a fan of crusts so I had a small throwback moment as I was this French toast was served crust-free. The sheet toast was a sheet cake, grilled in French toast dip and served with mixed berries, bananas, with chocolate and caramel sauce on top. This was a classic combination of fruit-meets-toast dessert and I thought this was the best dish of the meal. It was marginally more creative than the otherwise regular-looking menu and the fluffy texture of the sheet toast-cake hybrid won me over as a fan. If you're looking to indulge in your sweeter cravings, don't hold back on this sheet toast. Eggspectation takes up residence at a former IHOP restaurant and while the exterior largely looks the same, the interior was pretty much gutted inside and out. The dated booths of the longstanding IHOP have been redone with the Eggspectation flavour and the colour palette is a huge improvement over what used to be here. I'd been to the IHOP once before and it was a pretty dim atmosphere despite its billing as a family-friendly restaurant (shoutout to fans of the movie "I Am Sam"). Inside there is seating for about 100 guests amongst booths, tables, and bar stools. The music in the entrance is a little on the loud side but could probably be adjusted depending on how many people are waiting. I've seen some Yelp reviews where reviewers complained about long wait times, but I can confirm that at 11am on a Saturday, diners were being seated promptly as tables emptied out. Would I go back? Yes if I'm in Richmond looking for brunch.